It’s a sign of how out of date I am with posting up my baking challenge that there was still some trace of warmth in the air when I served up my salmon and leek quiche (alongside a salad), which I made for the series two pastry week signature challenge (since my birthday I’ve been in a pretty hectic phase). The recipe I chose was an adaptation of one from the famous and iconic food blog Chocolate and Zucchini, which I have been reading since I was a teenager. The first food blog I discovered actually no longer exists – a sad day indeed – but Chocolate and Zucchini was the second I started reading regularly. 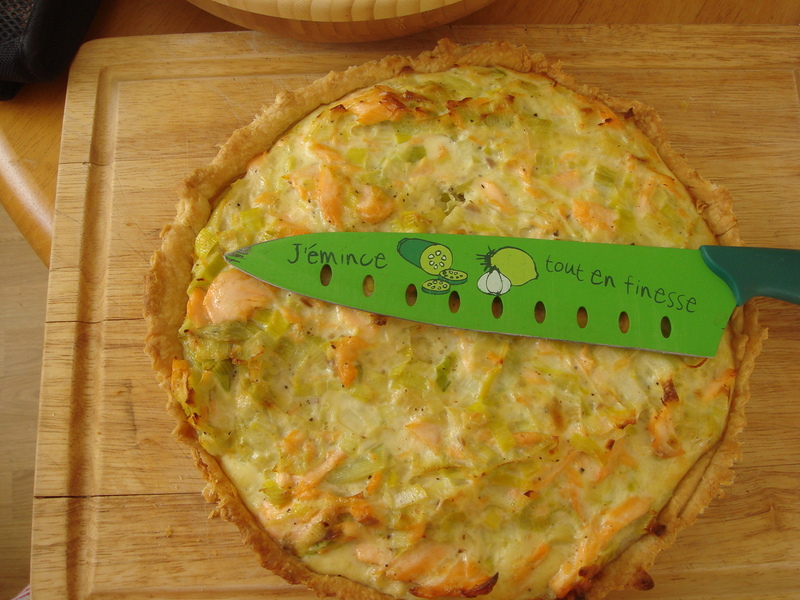 I combined this recipe with some of the proportions from a spring vegetable quiche baked by Janet, one of the series two contestants, who did really well on quiche week. The proportions for the savoury custard from the Chocolate and Zucchini recipe seemed a little off for my taste, hence the merger of the recipes. I was very proud of this quiche: unusually for me I took my time and was patient in assembling, chilling, and blind baking, with the result that the base of the quiche was golden, short and crisp throughout – the three of us eating the quiche jokingly scraped the underside and there was no sign of the ‘soggy bottom’, the fear of which apparently plagues contestants throughout pastry week, but which has also become a bit of a tedious Bake-Off catchphrase (like ‘style over substance’, constantly lobbed at series four winner Frances). The quiche is truly delicious. Although it combines rich, slightly sweet salmon, slippery-sweet leeks and unctuous cream, it wasn’t heavy or cloying, but rich and smooth. 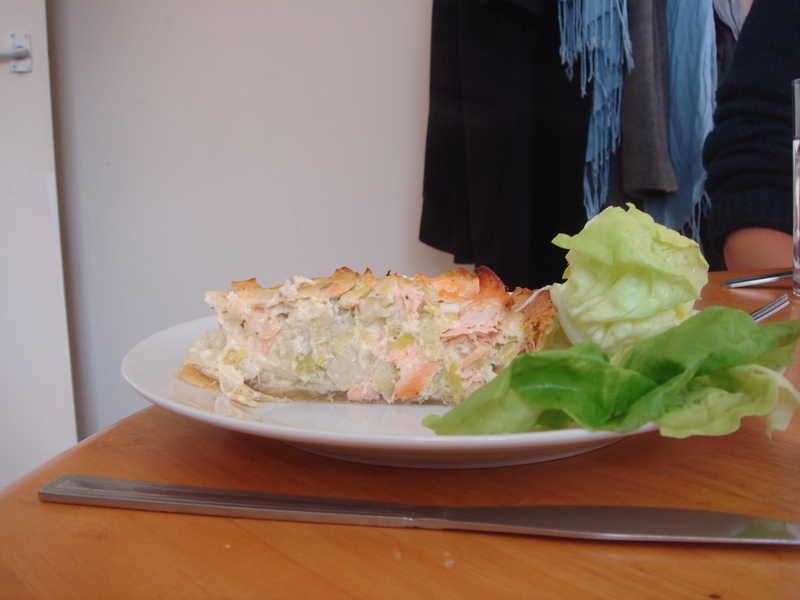 The subtle onion taste of leek is really perfectly matched with salmon, and the crisp texture of the pastry was a lovely counterfoil. The quiche has lots of different textures, as well. I was pleased I’d increased the savoury custard element as it was necessary to hold all the filling together. My only note of caution would be that you ensure you season everything well. It’s really lovely and light (in sensation rather than ingredients) and is a recipe I’d be happy to make again (not something that I can say of everything I’ve made for the baking challenge, much of which has been delightful but a decided one off). Incidentally, I realised that I need to draw a line under the baking challenge. I started it with the intent of improving my baking, genuinely belieiving the Great British Bake-Off would last five, maybe six series or so, before being lovingly retired. However, the show has become a phenomenon, watched by the general public, discussed in offices, and not just by foodies, and is even moving from BBC Two to BBC One, a sure mark that it’s set to become the next MasterChef. I don’t want my life (or blog) to be beholden against my will to a challenge I set myself on a whim; hence, I will be carrying out the challenges up to the end of series four, and then taking stock and moving on. There are other projects I want to set myself and I want the challenge to remain fun and creative, rather than a millstone I drag with me into middle age. Also, as the GBBO challenges are becoming more complex and professional, I am starting to think about limits to what I can achieve in the kitchen. Combine the flour and salt in a bowl. Rub or cut in the butter, either using a pastry cutter or your fingertips (rubbing your fingertips against the pad of your thumb) until the butter resembles large flakes, like porridge oats. Butter your quiche tin. Roll out the pastry into a 25cm circle and lift carefully into the quiche tin to line it. Press the pastry into the edges of the tin using a little excess pastry and trim off the excess pastry. Line with a piece of baking paper (I always crumple it to make it easier to fit) and fill with baking weights. I then chill again, 20-30 minutes. Melt the butter in a large frying pan over medium heat; add the sliced, cleaned leeks and salt and pepper. Cook on medium heat, stirring occasionally, for about 20 minutes, until completely soft, cooked down and melting. Drain off any liquid that has accumulated – I didn’t actually have any as the cooking process had driven off the excess, but this can very. Meanwhile, for the salmon, bring a saucepan of water to the boil. I added some aromatics – bay leaves, peppercorns and a dash of nutmeg – but this is optional. Turn down to a simmer. Slide in the two salmon fillets, cover and simmer for 6-10 minutes (depending on thickness). Remove carefully, drain and flake using a fork. I kept the flakes quite chunky. Discard the aromatics. Beat together the eggs, cream and milk, season with salt and pepper, and stir in the cooked salmon and leeks. Mix gently to combine. Preheat oven to 200C. Pop your lined quiche tin into the oven and bake for 20-25 minutes, until just golden. Remove from the oven and carefully remove the baking beans and baking paper. Place back in the oven for 5-10 minutes until the crust is golden and with a dry bottom. Reduce the heat to 180C. Pour the filling into the pre-cooked pastry, place in the oven and bake for 30-40 minutes, until the filling is set (I use a knife to test rather than just wobbling it). Let stand for 10 minutes or so before easing out of the quiche tin. I recommend serving with a salad. Thank you! It’s a delicious recipe. The knife was given to me by a friend who got it in Paris (very ooh la la) and has a cheese knife as well that’s also very cute.